While we have been hearing quite a few rumours about the upcoming flagship Lumia smartphones, the handsets were now spotted on the company’s official store. 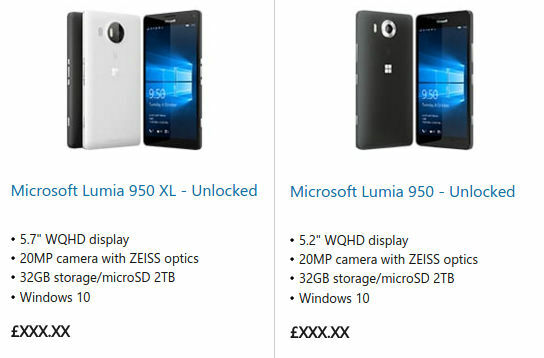 The Microsoft Lumia 950 and Lumia 950 XL, which are the company’s latest upcoming smartphones were listed on the official Microsoft Store in the UK. The listings confirm the specs of the handsets. The listing reveals that the Lumia 950 would have a 5.2 inch display whereas the Lumia 950 XL would have a slightly bigger 5.7 inch display with Quad HD resolution of 2560 x 1440 pixels. The Microsoft Lumia 950 and Lumia 950 XL are said to pack in a 20 MP PureView camera with ZEISS optics. The Lumia 950 is said to be powered by the Snapdragon 808 processor whereas the Lumia 950 XL is said to be powered by the Snapdragon 810 processor. Interestingly, the handsets are said to have iris scanners. We should have more details soon.